(South Plainfield, NJ – July, 2016) The TEMPTU AIRbrush Makeup System®, the world’s first do-it-yourself airbrush makeup technology, debuted to great acclaim back in 2009. NJ-based product development and manufacturing company Ariel Laboratories collaborated with TEMPTU to create the makeup formula to support what, back then, was considered revolutionary. The intent: deliver flawless makeup application, once the exclusive domain of professional make-up artists, in a convenient, at-home, do-it-yourself system. With the help of Ariel Laboratories, TEMPTU accomplished this. Once reserved for professional use behind the scenes on film, television, and fashion shoots, TEMPTU designed its system to be user-friendly, enabling consumers to achieve professional level airbrush results. The original system and components weighed in at almost two pounds, occupied a considerable amount of counter space, and required an electrical outlet to operate. Fast-forward to today, and the introduction of the latest TEMPTU device, a significantly more compact version of the original. The mechanism and airbrush are now comprised of a single, handheld cordless device that can be charged, and dispenses with a much quieter hum. A smaller and lighter version of its original self, the new TEMPTU device weighs less than nine ounces. 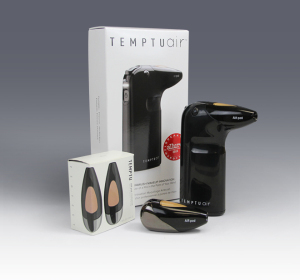 TEMPTU AIRbrush Makeup System was the brainchild of TEMPTU CEO Michael Benjamin. Those in the makeup industry recognize the TEMPTU name as a leader in makeup innovations and professional airbrush applications. The latter was Benjamin’s original inspiration for the do-it-yourself technology. The AIRbrush system has received numerous awards and recognitions since its debut. Most recently, the latest TEMPTU system was honored by Allure magazine with a Breakthrough Beauty 2015 award, and by Women’s Wear Daily with a Prestige Beauty 2015 Product of the Year award. There’s nothing new about people using mascara to enhance the color and shape of their eyes. The Egyptians were doing it 4,000 years ago. However, when a mascara gets formulated with light-resonating properties and still meets the highest environmental and safety standards, that’s news. The new mascara formula is now being manufactured in super-bright and muted colors, both with the ability to bring out latent eye color. The new formula also doesn’t smudge or “cry away” and is easily applied with any well-designed brush. With only mineral pigments being used, the product is Polyethylene Glycol-free. Polyethylene Glycol (PEG) is the commonly used poly ether compound that contains potentially toxic ethylene oxide and Dioxane, and has come under extreme scrutiny of late. This new mascara will be genuinely welcomed on the shelves of California retailers where a product is not allowed to have a single trace of Dioxane. The new formula is best packaged in round, slender containers which extends product life and minimizes drying. A slender, round brush large enough to pick up across the entire product surface provides outstanding application results. For more information on Ariel Labs, please visit us here. This time it’s a facial cream with multiple cosmetic benefits and one important health benefit. It’s a new Blemish Balm Cream that provides significant UVB protection along with many other advantages. This new Blemish Balm Cream, which has taken on the nickname of BB Cream, satisfies several cosmetic needs in a single formula. It’s a combination moisturizer and cover-up that minimizes lines and wrinkles. It also masks slight imperfections on the surface of the skin. Perhaps the most appealing property of BB Cream may be its added ability to protect against UVB rays. It has an ultraviolet protection factor of SPF 15. SPF stands for Sun Protection Factor and has become a standardized measure of UVB protection, rating products from 1 to 45 and above. An SPF 15 rating means BB Cream filters 92% of the UVB rays that redden the skin in sunlight. So BB Cream allows a person to stay out in the sun 15 times longer without showing the effects of harmful UV rays. BB Cream is the result of Ariel Labs’ ongoing effort to identify innovative products and formulations wherever they may exist in the world of cosmetics. The product is currently offered in a single, subtle, skin-tone shade with more shades to follow.